In a convenience-driven world, the choice between getting takeout and visiting a restaurant seems obvious, especially for busy college students. Because of apps like Seamless, Caviar and Postdates, food delivery has become more accessible than ever. 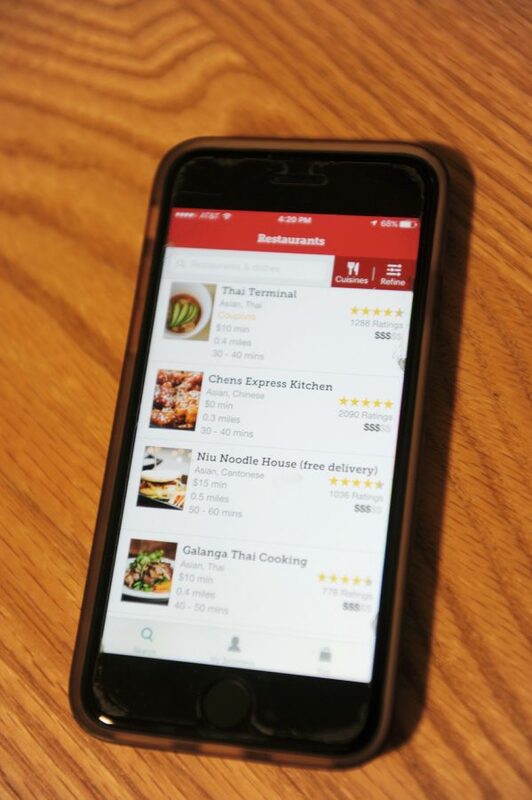 Customers have the ability to choose just about any cuisine from any restaurant they want for reasonable delivery prices — it’s no wonder the business is booming. For people like GLS freshman Riley Blake, who would much rather sit in the comfort of their own homes, food coming to you instead of you going to the food is a dream come true. And delivery has made this feasible — takeout eradicates all unnecessary hassles, and for constantly busy Violets like Blake, it is not uncommon to order takeout at least once a week. With this reasoning, takeout proves impossibly easy and highly irresistible. Despite all the benefits, delivery produces some unnerving and unforeseen consequences — and not just for restaurants. Online shopping in general has shaped where and how customers spend money. The popular department stores Macy’s and Sears recently announced the closure of over 100 storefront locations due to the increasing number of online shoppers — consequences of the online ordering craze. People no longer possess the motivation to visit physical stores, and this has caused over 44,000 retail workers to lose their jobs in 2016. The delivery trend — which was developed for the busy 21st century world — began as a peaceful extension of tangible stores, but it quickly became an uncontrollable phenomenon that ominously looms over the food world. It would be regrettably easy for restaurants to recognize their overhead costs and workers as a liability, especially with the tempting budget cuts that machinery and delivery can provide. This movement directs money into the pockets of happy shareholders while leaving thousands unemployed. If restaurants see an increase in online orders the way department stores have, the threat of mini-restaurant factories producing and delivering all food could be realized within the decade. Becoming responsible consumers in a society that promotes convenience over community involves leaving the couch and dumping your takeout menu. According to a 2015 study on Wall Street Research Reports and public filings, 13 percent of food industry transactions already happen online. With the delivery trend furiously on the rise, robots could be making our food sooner than we can say bon appetit. What would this do to the future of dining? The truth is, there’s no certain future for our favorite locales, but to ensure their success in our communities, we must remain avid patrons of small businesses to prevent corporate food chains from turning our laziness into a menacing monster of capitalism. Sacrifice and love are required to make food. To respect the process, and the art of cooks and bakers, the least we can do is leave our dorm rooms to pay eateries a visit.